In 1931, Eliot wrote to Spender that he found Beethoven’s A minor Quartet “quite inexhaustible to study” and he wished he could “get something of that into verse” before dying. Four years later he wrote Burnt Norton, the first of the Four Quartets, and the above statement, together with other remarks on the composer, have significantly influenced critical studies on the relationship between Eliot’s poem and music. The wide range of possible comparisons so far proposed reveals a fundamental and thorny issue inherent in interart studies, which should consider the deep divide between direct mutual influences and more general and indirect analogies between poetics, contents and forms. 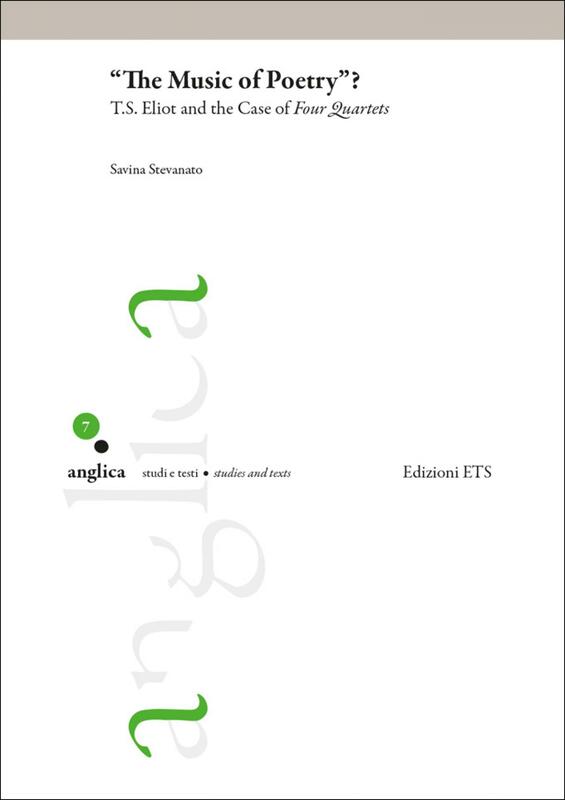 Stevanato interprets the Quartets’ musicality by combining an intermedial approach with a cultural and aesthetic contextualization of Eliot’s modernist poetics, and, finally, with a textual analysis of the poem. Shifting the critical perspective onto the text itself, this study reads the poem’s musicality in the light of an interpretation of Eliot’s idea of “intersection” which is at once conceptual, formal, and thematic. In Four Quartets, this notion works as a formal and figuratively musical device which marries music and the religious Incarnation in a fusion of words, the Word and music. Savina Stevanato teaches English literature and received her PhD from Ca’ Foscari University of Venice. Her research interests lie in the field of interart studies, with a focus on the relationship between the verbal, the visual, and the musical codes, and on postmodern adaptations. Among her recent publications are: Visuality and Spatiality in Virginia Woolf’s Fiction for Lang (2012), “Hamlet’s Distancing Devices: Verbal and Visual Marks of Modernity” (2016), “Angela Carter e John Ford: il Peccato dell’identico” (2017), “Knitting against the war: Virginia Woolf’s building-up of forms” (2017).